Slick Productions - Robin? Who is this girl. And why does she call you 'poo'? 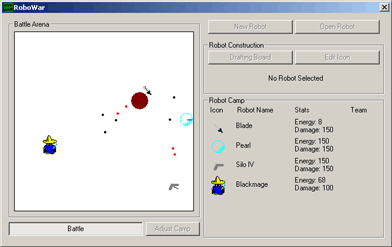 Robowar was a "game" which I played back on my old Machintosh long ago. I use the word "game" loosely, because Robowar is not the kind of game that you can just pick up and play. It's a game for computer nerds to build up programming skills of sorts. Learning how to play (and again, I use the word 'play' loosely) you have to dedicate a considerable amount of time to learning how to build and design your own robot. Needless to say, Robowar is not a game which will appeal to everyone, but it is strangely fun and addicting once you get into it. I wrote it quite a long time ago, so it isn't as good as I could/should be, but it's still worth checking out if you're a big computer geek like me ^^.